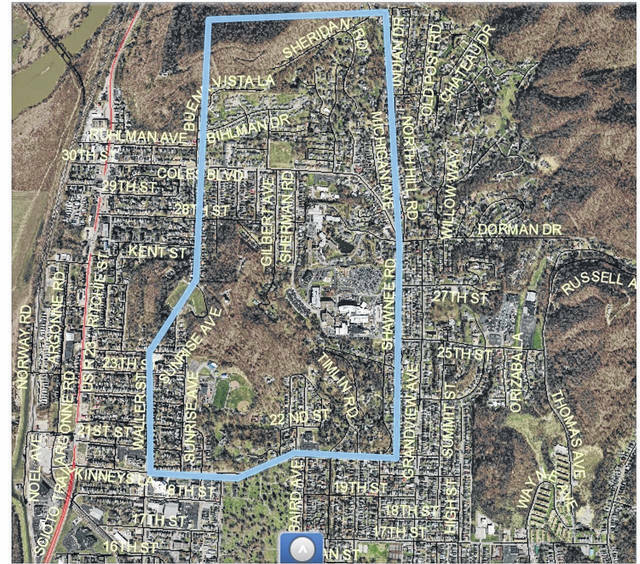 Provided by the Portsmouth Health Department, this map shows the area of the city in which residents were being advised to boil tap water as of Tueasday. As of approximately 1 p.m. Tuesday, a very tired sounding Acting City Manager Sam Sutherland said a boil warning was still in effect for residents of the so-called hilltop area of Portsmouth and Sutherland was hesitant to say when water service throughout Portsmouth might return to normal. Sutherland said the culprits behind the city’s most recent water problems were two water line breaks, one at 12th and Lincoln streets and the other in the area of Fifth and Market streets. In announcing the continuation of a boil water warning, the city health department said the second break took place on Market near Valley Foods. Sutherland added the breaks were just bad luck and unrelated to the ongoing replacement of major lines reaching the city reservoir. According to Sutherland, water crews have been working virtually nonstop since Friday to fix water problems. He added crews were able to take some time off intermittently to sleep. Sutherland noted that while residents may be getting impatient with water shortages, they have also shown kindness to the crews on the street, for example, bringing them pizzas free-of-charge. Acting Mayor Kevin Johnson backed up Sutherland regarding the condition of Portsmouth water lines. Asked how many people were affected by the water line problems, Johnson said that number was “undoubtedly in the thousands.” He asked the residents to show some patience. “I understand their frustration, believe me,” said Johnson, who with his family spent part of last weekend handing out bottled water around Portsmouth. The mayor wanted to hold up firefighters from Portsmouth and surrounding communities for special praise in helping at SOMC, hauling water to the hospital in pumper trucks. “They’ve sort of become unsung heroes in all of this,” Johnson said. He added he hopes residents can become unsung heroes themselves, checking on neighbors especially the elderly or any shut-ins, making sure they have water and are safe. • 1500 and 1600 blocks of 12th St.
Sutherland said he did not necessarily agree with that statement. While he advised boiling water for drinking, he felt common sense could dictate whether to use water for bathing or washing your hands. He said if water looks overly contaminated don’t use it for any kind of bathing or washing clothes. Both Sutherland and the city health department said water is available at the water filtration plant in New Boston near Walmart. Johnson noted residents must bring their own jugs to be filled at the plant. Bottled water is, of course, also always an option. At the Portsmouth Kroger, a manager reported there was no shortage of that item on store shelves. He declined further comment directing questions to Kroger’s corporate headquarters. A phone call to the number provided was not returned. According to Johnson, after a discussion with Sutherland on Sunday, his understanding is that once repairs reach Kinneys Lane, the idea is workers will take a break, allowing pressure in the lines to return to normal. Early Tuesday afternoon, Sutherland said the city may have been able to blast water up to the hilltop area, but feared doing such would stir up the pipes, causing the scattering of what he called “tuberculation,” which according to a Google search is “the formation of localized corrosion products scattered over the surface (of pipes) in the form of knob-like mounds.” When water is forced harshly through the pipes, those materials become loose and are released into the water. One construction company website notes this is especially a problem in pipes nearing or over 100 years of age. In summing up, Johnson said one key to dealing with situations such as this is increased communication with residents. Towards that end, the city health department has set up a 24-hour call line at 740–354–8931. For the future, Johnson said officials are looking into setting up a service which can send text messages to all residents informing them of boil orders and related information. He said the issue was discussed at Monday’s City Council meeting. Police Chief Robert Ware is supposed to be checking into the cost of such a system, but Johnson believes it would be minimal adding he would be in favor of moving to implement such a system as soon as possible. Ware told the Daily Times his department has been dealing with few problems related to the water crisis. In the meantime, Johnson cautioned the city is liable to experience further water problems down the line. https://www.portsmouth-dailytimes.com/wp-content/uploads/sites/28/2018/06/web1_water-map-cropped.jpgProvided by the Portsmouth Health Department, this map shows the area of the city in which residents were being advised to boil tap water as of Tueasday.